Compound Sound offers an escape from the ordinary. Come join us in Wyoming! Outside of the city (less than 2 hours from Denver) and in the heart of the country, you’ll quickly reconnect with nature’s flow and return to a simpler existence. Here on the plains we share music, arts, and healing within a small camping community for three days and two nights. 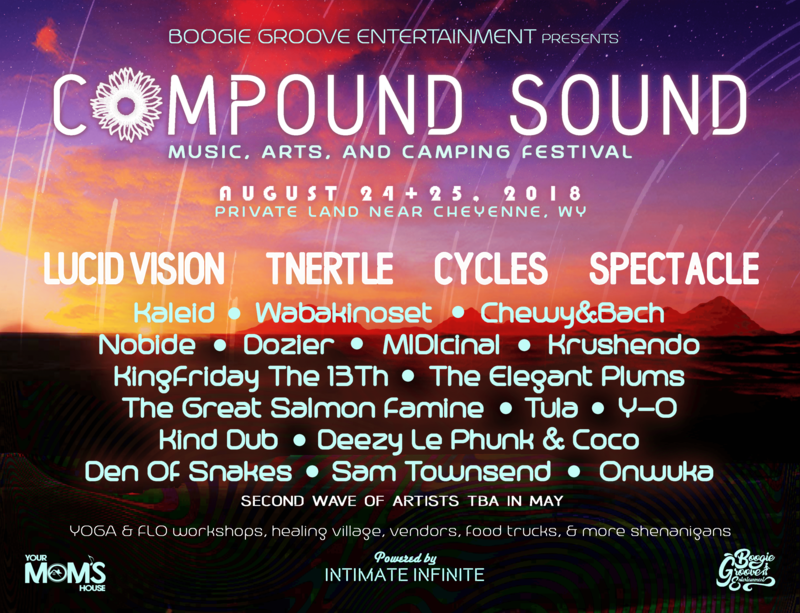 Bask under the bright stars of the Milky Way while the region’s finest musicians collaborate and create something unique to the time and place. Dance close to the permanent stage or wander far out into the fields; either way you’ll have the chance to experience freedom unlike that in which you ever have before. An event that has been kept fairly secret for 9 years is now being opened up to the vibrant Denver music scene and the forecast calls for one hell of a good party! Sam Townsend // Onwuka + Many More! Wave 2 coming in May!